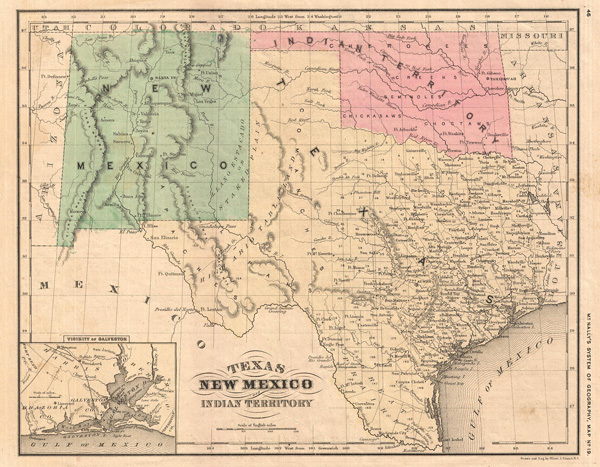 Texas, New Mexico, and Indian Territory. This richly detailed c. 1870 map of Texas, New Mexcio, and Indian Territory (later Oklahoma) is delicately shaded, with relief shown by hachures, and finely detailed. Includes inset map of 'Vicinity of Galveston.' Drawn and engraved by Oliver Stuart of New York. Published as Map No. 19 in McNally's System of Geography. McNally, R., McNally's System of Geography, (Chicago) 1872. Very Good. Even overall toning.